When In Manila once again held the Blogapalooza event on November 16, 2013, this time at SM Aura in The Fort, Taguig City. 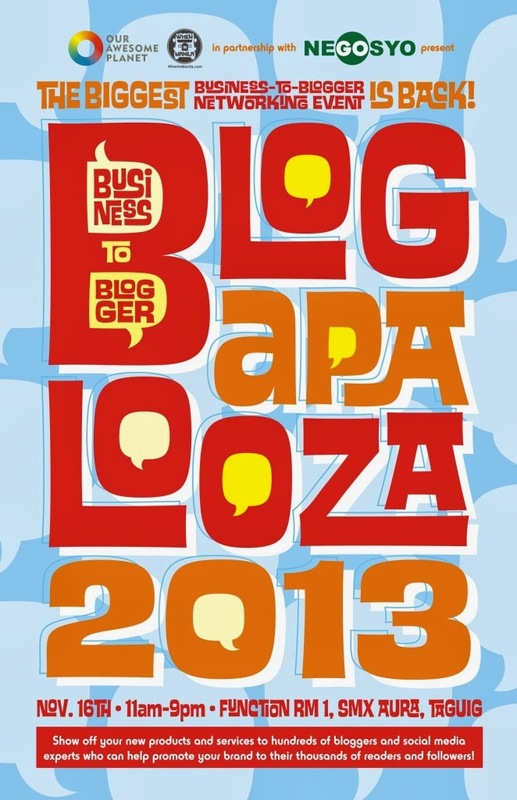 Blogapalooza is the biggest B2B (Business to Blogger) networking event we have today. It's a great venue to interact with brands and products that bloggers can work with and write about. #Blogapalooza is one expo event that bloggers shouldn't miss because of an opportunity to network with both bloggers and the brands. Also, it's an opportunity to forge possible projects and campaigns too. Bloggers are strong online influencers that brands need for promotion. Blogapalooza hopes to bring the latest products and services of the brands to bloggers and vice-versa. Each brand had a representative to present their latest products/services/campaigns and engaged the audience with some simple games like tweeting a specific #hashtag tagging the brand's Twitter account. There were also some speakers who shared their knowledge and expertise about their work that is related to writing/blogging, digital marketing, public relations, sales, and nethics (my own term for "ethics on the net"). A brief question & answer forum followed right after a batch of speakers. These are the brands that participated in the expo: The Mind Museum, Grab Taxi, Chef’s Noodle, Ambient Digital, Easy-PHAMAX Wheatgrass, San Miguel Foods, Gurrka.com, Zipmatch, Figaro, BYS Cosmetics, Megaworld Lifestyle Malls, Viewpark Hotel Tagaytay, PLDT, Enjoy Philippines, Tempura Japanese Grill, Karate Kid, Congo Grille, Flavors of China, Bounty Fresh, Gavino’s Donuts, GoNatural, Slenda, Tiño Suits, LazerXtreme, RichPrime Toys, YSA Skin Care Products, Plato Wraps and Brownbag Coffee Solutions, Smart, Whirlpool, Fujidenzo, Miles & Levels, I Love Lulu Nails, NY Theraspine, and Tropicana Coco Quench.